You probably already know all there is to know about Sony Ericsson's upcoming HD-video-flaunting Kurara. Well, instead of posing for small-time opportunists, this time Kurara is starring in a real blockbuster shot and directed by no other but Mobile-Review's Eldar Murtazin. Unannounced phones do get a lot attention but it's quite rare to see one star in a preview by a serious online media so long before its official announcement. Most of those pre-announcement meets are usually governed by some sort of non-disclosure rules (written or not). We guess Mr. Eldar Murtazin has been bitterly disappointed by Sony Ericsson - enough to break his own promises of not publishing any information harmful to the company (as mentioned here). Anyways, it's back to the star of the show - Sony Ericsson Kurara. We've uploaded several preliminary specs in our rumor mill section so you can learn more about it even at this early stage. Kurara is a Symbian S60 5th edition smartphone, akin to the Sony Ericsson Satio. It does have the 8MP camera of its sibling, but the HD label on the back hints of even more. If you guessed 720p video recording, you're right. That would put the Kurara in direct competition to the Samsung i8910 OmniaHD. The 720p video recording club is about as elite as the 12MP club. Anyway, it's a nice sign of change for Sony Ericsson, whose phones are notorious for their low-resolution video recording. Not to mention that the Kurara has a 3.5mm audio jack and a microUSB port. Now Sony Ericsson seem truly hard at joining the band of other manufacturers, which use standardized accessory ports. 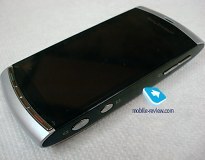 But back to our news topic, you can find the Sony Ericsson Kurara preview here at mobile-review.com. It doesn't offer much information about the phone but there are plenty of photos, screenshots and camera samples, and of course a video sample (which is good 213MB large). And here's a spoiler for you: next time we see a leaked HD recording smartphone, we really would prefer some real world live action as a video sample instead a video capturing a YouTube video shot from a computer screen.